CANNES, FRANCE – Acclaimed filmmaker Woody Allen gives off the impression that he is not one to accept change very quickly, or even willingly. Almost all of Allen’s films open with short, simple credits featuring white text on a black background. The typeface is always the same; Windsor. Up until “Midnight In Paris” in 2011 all of Allen’s films were released with a mono soundtrack, which might actually still be the case. In a recent interview with The Hollywood Reporter, Allen admitted that he’s not good technically. He doesn’t know how to work a DVR, doesn’t own a computer, has never sent an email and while he uses a mobile phone to make calls, his assistant had to put all of Allen’s beloved jazz records on it for him. Yet, Allen’s self-proclaimed technophobia doesn’t mean he’s a complete luddite. In fact, when he began working with his longtime editor, Alisa Lepselter, in 1998 on “Sweet and Lowdown”, she convinced him to begin cutting his movies digitally on an Avid system, rather than on a Steenbeck or Moviola using film. That said, Allen continued to shoot his movies on film until his most recent project, “Café Society”, which opens the 69th annual Cannes Film Festival Wednesday evening here in the Riviera resort town from which the event draws its name. Making one film every year for the past five decades, this isn’t Allen’s first trip to Cannes, nor is it the first time one of his movies has opened the festival. “Hollywood Ending” launched the 2002 festival, as did “Midnight in Paris” a few years back. “Café Society” does however mark two firsts for Allen; his first time working with award winning cinematographer Vittorio Storaro as a director and the first time he’s shot a movie on digital, rather than film. Allen is no stranger to working with multi-Oscar winning cinematographers. (Storaro has won three, including one for “Apocolypse Now”, which won the Palm d’Or at the 1979 Cannes Film Festival). The list of legendary cinematographers employed by the filmmaker throughout his career includes, Gordon Willis, Carlo Di Palma, Sven Nykvist, Vilmos Sigmond and, most recently, Darius Khondji. “For me it was an experience to work with an iconic cinematographer,” said Allen before going on in his trademark aloof manner to explain that he hired Storaro for “Café Society” simply because “he was available and I was making a film”. 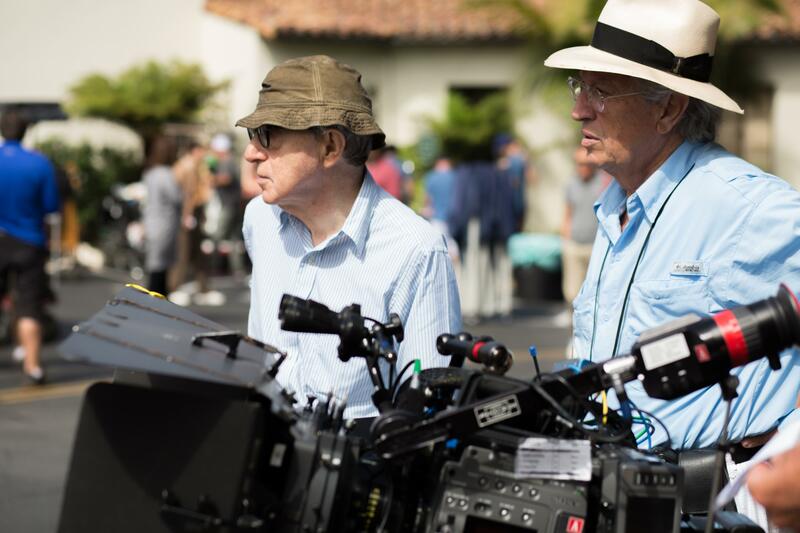 Woody Allen and cinematographer Vittorio Storaro on the set of “Café Society”.